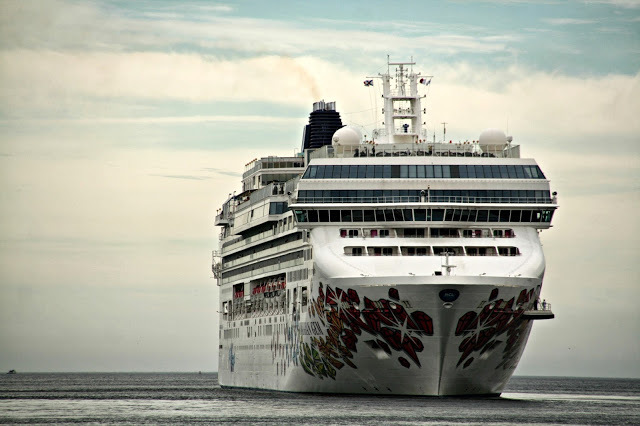 The 2016 cruise schedule is out. Looks to be another Good Year. Veendam Kicks things off April 30, and is back every 10 days or so. AidaMar wraps things up October 28. Highlights include Eight inaugural calls. There may be 2 more however – I have no record of Carnival Sunshine (Glory and Splendor have been the past carnival Ships) Appearing in Halifax also Serina Changed hands and was refurbished, She has previously called as Ocean Princess. Disney Magic is back in the fall, after an inaugural run in 2014, and then not appearing in 2015. This entry was posted in cruise ship on February 24, 2016 by Peter Ziobrowski. Saturday brought the arrival of the General Cargo ship Singelgracht. She waited for Algoma Dartmouth to to return from Port Hawksbury for bunkers, topped up, and has remained at anchor since. Last night brought the arrival of the Slotergracht to Pier 27. She is loaded with containers and a Fishing vessel on deck. (and presumably something else in her holds. 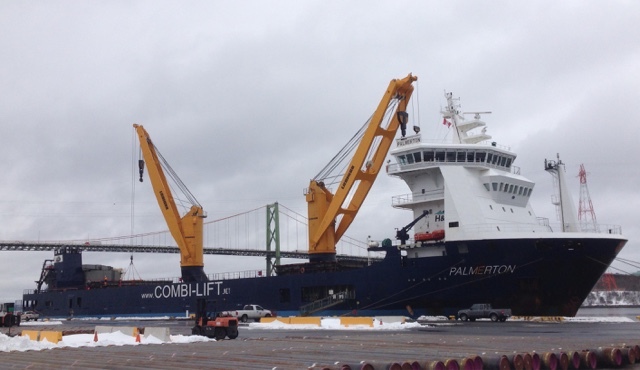 Both Vessels are part of Spliethoff’s Fleet. The S Class Features three 120ton cranes – two (Aft and Midship) to the Port Side and the Forward one to Starboard. and 5 Side loading Elevators, Which stick up on the port side, and allow the holds to be loaded without opening the hatch covers – which is useful for loading products like paper that must remain dry. This entry was posted in General Cargo on February 24, 2016 by Peter Ziobrowski. Zim Shanghai arrived this morning for Pier 41. She is a regular caller in Halifax. This entry was posted in container ship, halterm, ZIM on February 24, 2016 by Peter Ziobrowski. This morning brought the arrival of SPS Patiño, a Spanish replenishment ship. She is on loan to the RCN, to allow the continued training of crews with Replenishment at Sea Duties. Photo above by @darceymckay on Twitter. This entry was posted in Navy on February 12, 2016 by Peter Ziobrowski. No word on what she’s offloading, though its likely some sort of project cargo. This entry was posted in break bulk, General Cargo, pier9 on February 10, 2016 by Peter Ziobrowski. Today’s one arrival Primus at pier 42. She is due to sail this afternoon. This entry was posted in container ship, Melfi on February 8, 2016 by Peter Ziobrowski. 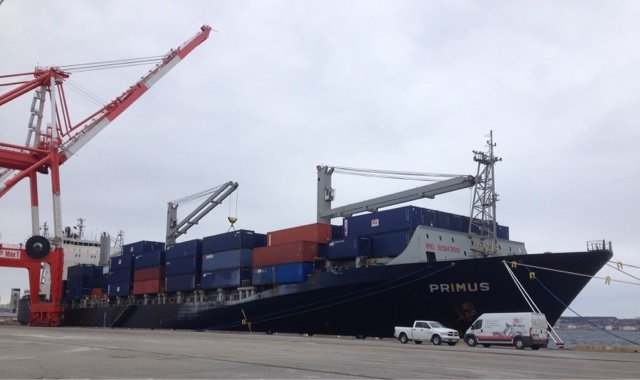 CMA-CGM Titus arrived around noon at pier 41 and is expected to sail later tonight. 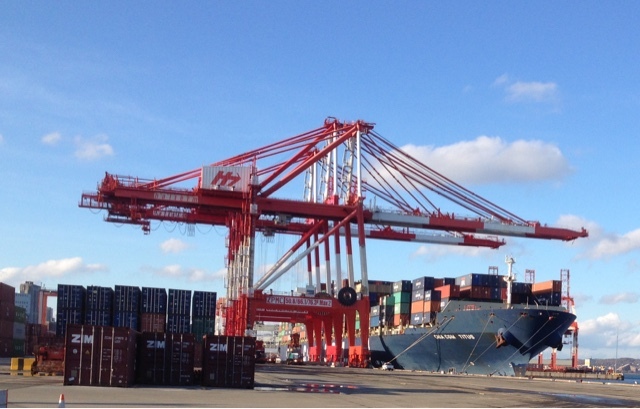 This entry was posted in CMA-CGM, container ship on February 7, 2016 by Peter Ziobrowski. ARROW was an enlarged version of the standard American wartime tanker design. She was one of the oldest tankers in the fleet of Aristotle Onassis, owned by the holding company Sunstone Marine Panama. At only 11379 Tons, she is about the size of AlgoCanada, one of the many products tankers that frequent Halifax. 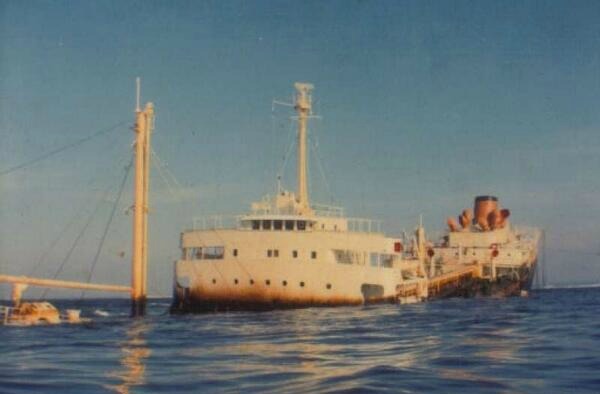 On February 4, 1970 ARROW was approaching Port Hawkesbury under charter to Imperial Oil Limited and just about to complete a voyage from Aruba. She was carrying 10 million litres of Bunker “C” oil bound for a paper company near Point Tupper. 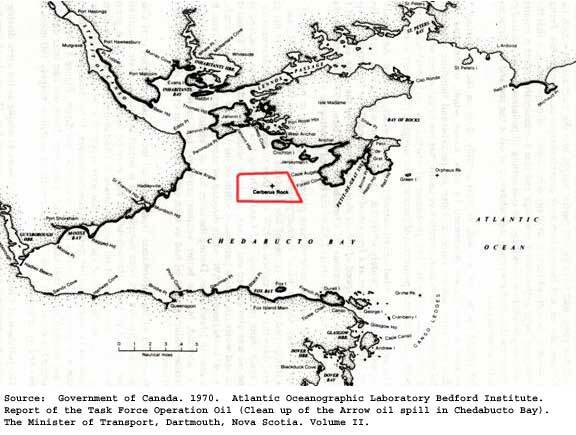 Entering Chedabucto Bay, the tanker encountered severe weather and gale force winds. She ran aground on Cerberus Rock, a well-known navigational hazard that lies in wait just below the surface of the bay. While it initially appeared that there was no threat of fuel leakage, the heavy weather continued to pound the stricken tanker. Imperial Oil issued an oil spill alert and the crew were evacuated. By the next day, an oil slick one mile long had formed and on the 8th, the ship finally split in two, with the stern sinking in deeper water. Attempts to take off the cargo were not successful nor were the attempts to recover her stern. In all, about 10,330 tons of fuel were spilled, coating 75 miles of the shoreline with thick black sludge threatening wildlife and the fishery. Shore cleanup was a long difficult process as was the transfer of what was left of the oil aboard ARROW to the barge, IRVING WHALE (Ironically the IRVING WHALE became an another environmental concern a few months later when she sank off Prince Edward Island with oil and PCBs which had to be recovered in 1996.) The final retrieval of oil from the ARROW wreck was completed on April 11 and pioneered many clean-up techniques used in later tanker disasters. This entry was posted in oops, tanker on February 4, 2016 by Peter Ziobrowski.